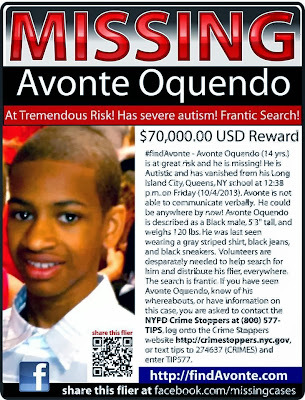 Avonte Oquendo is an autistic 14 year old. 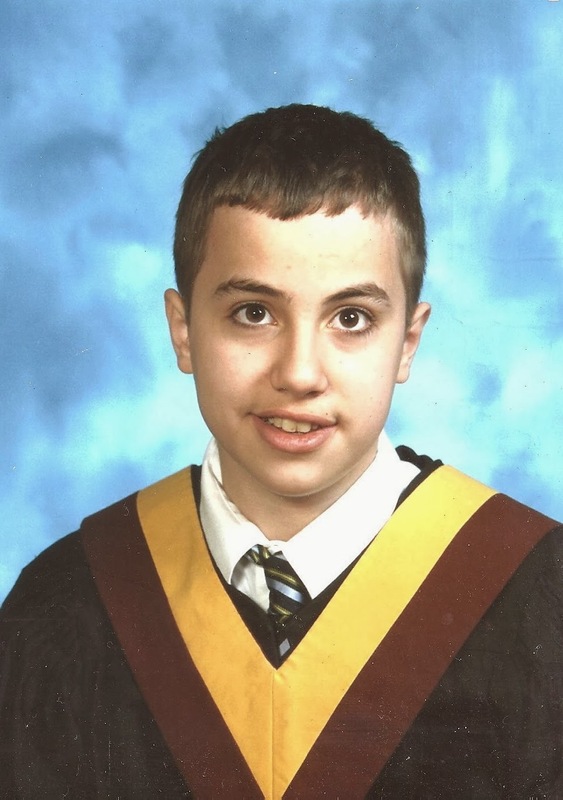 Non- verbal, and with limited personal care skills, he wandered away from his school thee weeks ago. Walked out of a classroom filled with teachers and aides who all knew of his wandering tendencies, and past a security guard at the school door. The family's greatest hope right now is that Avonte was taken, The alternative is too horrible for them to comprehend. Wandering is all to common a phenomenon amongst autistic individuals. It can be a misnomer too. Most do not wander. They bolt. with no warning, no rhyme or reason. It is the most challenging aspect of autism. I know. Because my son is a wanderer. From the time he was able to walk I have had to keep an almost paranoid eye on my son. He figured out any lock, any barrier. And he would do it by observing. So you had no idea he knew until he had bolted. 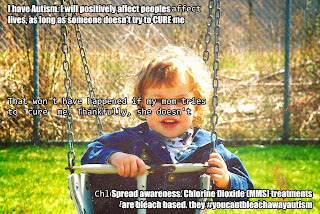 By 1995, when my son was two, even before we had a diagnosis, all the windows in my home had been nailed shut ( finding a 2 year old who'd been sound asleep in their crib on a window ledge, of what had been a locked window, at three in the morning is cause, at 3 in the morning, to nail every window shut). By the time he was 4, you needed a key to get OUT of my house. I endured the taunts of in-laws complaining I was paranoid. I chose to deal with their insensitivity rather than lose my baby. At three years old, my mother and I and my son were in the yard. Our neighbour came over and asked if I could fill his watering can, his wife was in the shower, but he wanted to water his plants. I walked down the 5 steps to my basement, filled the watering can. Came back up. My son was gone. Neither my mother nor the neighbour had seen him disappear. Thankfully out of the corner of my eye I saw our family dog running down the street, so I ran after him. Only to see, 2 blocks away, my 3 year old baby bolt across a major street, in front of a tractor trailer. I was running as fast as humanly possible, but he was still 2 blocks away. A man dashed into the intersection, swooped up my baby and the two of them fell safely onto the sidewalk. Unfortunately, this was not the last time I would feel what Avonte's mom must be enduring at this moment. When Eric was 8, we had gone to the zoo. On the way back, my tire blew. We got to ride home in the tow truck, all my boys thought it was great. When we got home, I unlocked my front door, let the boys in and turned around to write a cheque for the tow truck driver. Driver paid I turned around walked into my front door, and once again, Eric was missing. In those few seconds it took to write a cheque, he had unlocked the back door and wandered. It took 2 hours but he was finally found 3 blocks over in someones basement, asleep amongst their collection of Disney movies. Around the age of 13, Eric seemed to stop wandering. It even became possible for him to sit on the front stoop. Or walk over and watch the neighbours work on their car. But then, around the age of 17, the wandering returned. Horrifically. He was gone for 3hours. The equivalent of an amber alert was issued. He was found in a store several blocks away. Past train tracks and major intersections. Eric doesn't understand danger. Does not know to stop for a red light, does not know to look for cars before crossing a street. Would very likely try to walk up to a moving train. During those 3 hours, my older son and I scoured the neighbourhood, along with police, postal workers and transit workers. Screaming for Eric. Later, when Eric was found, barefoot , and brought home in a police car, my neighbour mentioned to my son that he had seen Eric walking down the street alone. He had also been outside moments later, and for the ensuing hours, while we were running around terrified with no idea where to look. We have known this family for 18 years. Yet he did not try to stop Eric, nor did he tell us he had seen Eric. Every time my son has bolted, and in all the situations with other families of autistic children that I have heard about, SOMEONE sees. And does nothing. Doesn't even bother to remember details. My Eric was lucky. He was found. Each time. But NOT due to the help of the people who WITNESSED him bolting. Avonte was observed to be wandering. And he was not guided back, nor was anyone alerted. 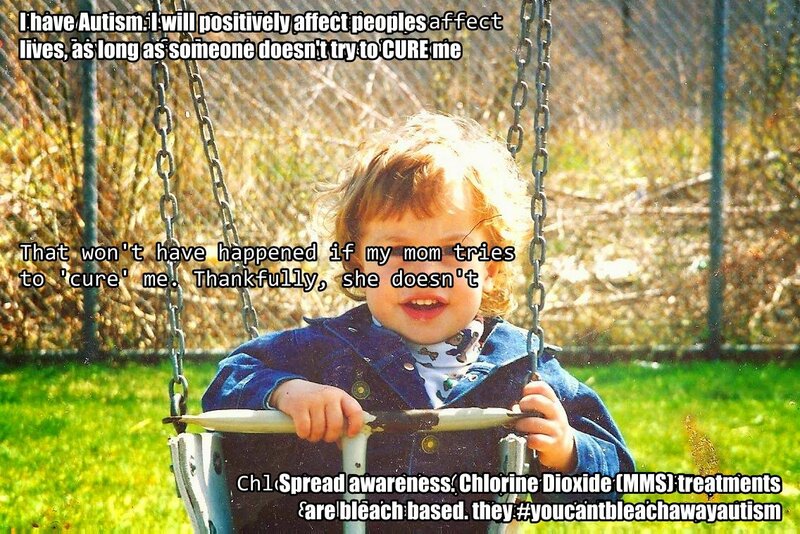 Each year hundreds of autistic children across the globe are found drowned (water is a very common obsession for autistic children). In almost every case, someone saw them wandering. This is not acceptable. Living in a household with autism is not easy, but we love our children unconditionally, so we do everything possible for them. That's why I have such a hard time with this notion that people, strangers OR friends, can stand by and pretend to themselves they see nothing. If the same child had fallen and scraped their knee, such same people would react right away. But a child wanders, with a high likelihood of a tragic outcome, and people ACTIVELY ignore. It is a concept I cannot grasp. I should never have felt the horror of my son being missing for several hours. Ever. People were aware each time. The same is true for Avonte's mom. She should not be living this horror. And whatever fate has befallen Avonte, he did not deserve. He should have been protected. Simply, had he not been ignored, he'd be home at this very moment. Please. If you see someone with a developmental disability, or someone who seems confused (as in Alzheimer's) at the very least remember details. It could mean the difference between a mother enduring a few moments of horror as opposed to planning your child's funeral. For those of you caring for someone with autism, Awaare , (although it is an Autism Speaks offshoot, and I loathe Autism Speak) is an incredible resource for information and tools to help you keep your loved one safe. If you live in the US there is even the Big Red Box program. 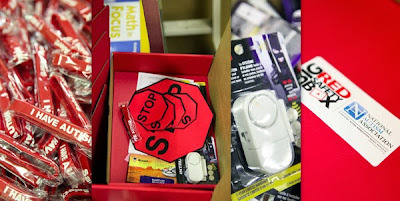 A free wandering prevention kit. 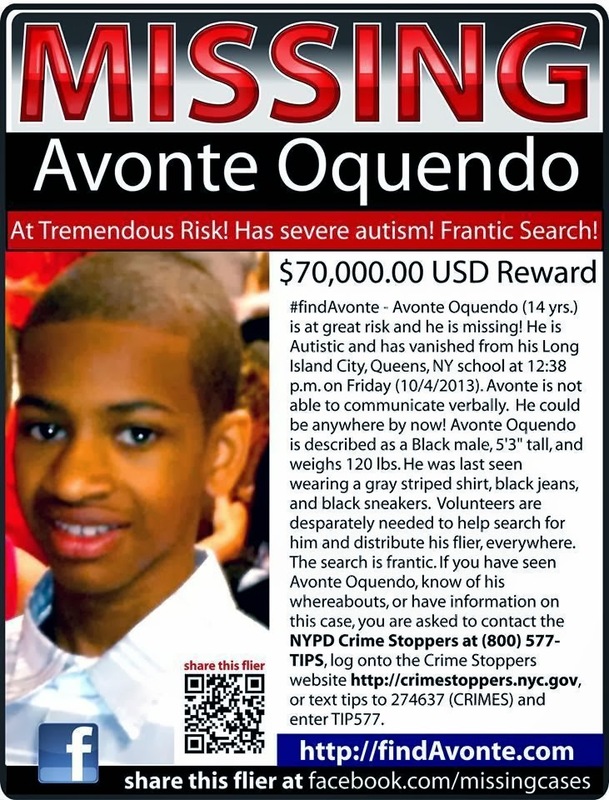 Please, lets work very hard to make sure no other mother has to endure what Avonte's mom is dealing with at this moment.